Have you ever dreamed of playing the drums? "Marty Brasington is a walking definition of versatility." Marty Brasington is now accepting students. Whether you are a beginner or a seasoned pro, Marty's 35 years of drumming experience will provide you with the expert instruction you need to help you become a better drummer! 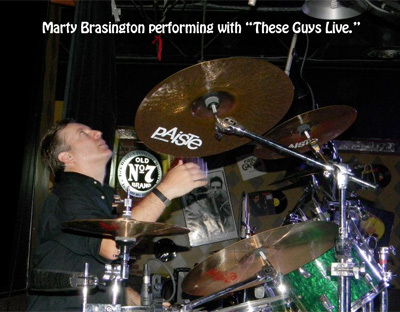 Marty Brasington is a dedicated musician and instructor with over 35 years of playing experience as a successful live and studio drummer. 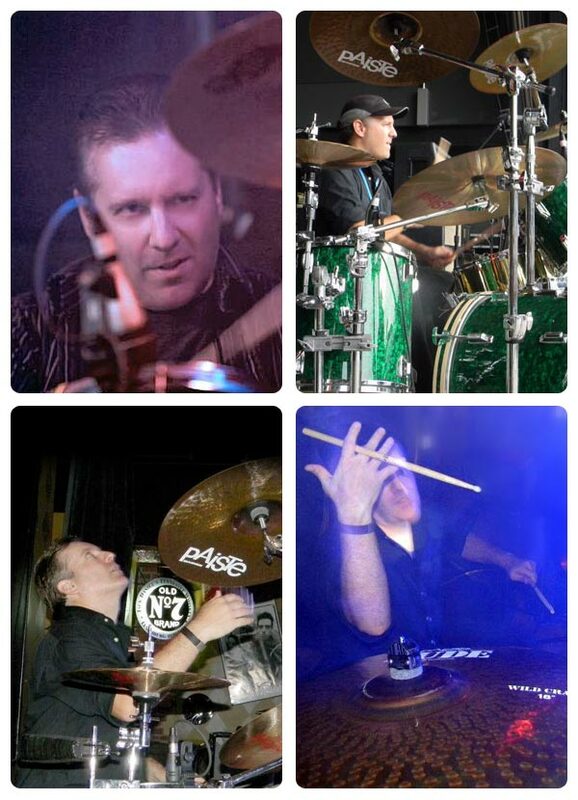 Marty started his career like many drummers, playing in his high school marching band, and quickly became interested in playing the drum-kit. After high school Marty studied at the famed Berklee College of Music in Boston, MA. Marty then moved to the greater New York City area, where he began recording and touring in both the U.S. and Europe with several projects including the melodic rock band Norway (Frontiers Records), singer/songwriter Laura Diamond (3 Wishes Records), alternative rock band Active (Tribeca Artists Records), Danger Danger (Sony Records) lead singer Ted Poley, as well as a variety other projects, which included playing over 150+ dates a year on the Jersey Shore. Click here to listen to some of Marty's recorded work! 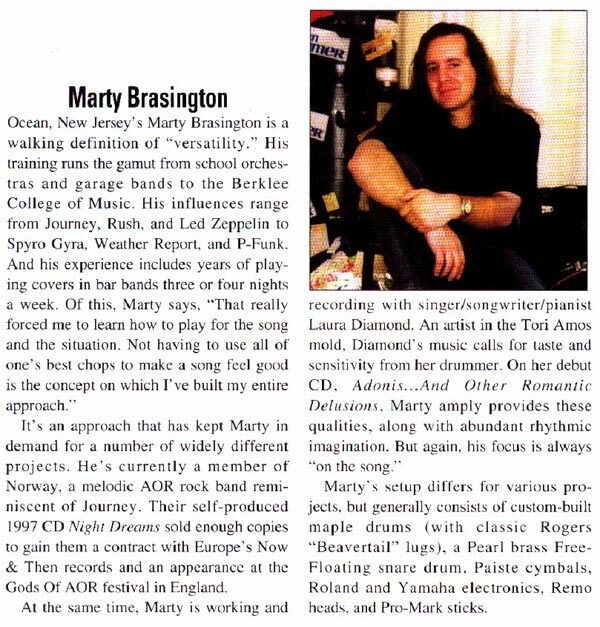 Marty has also been featured in both DRUM! and Modern Drummer magazines! For the past 5 years Marty was the drummer with the popular Columbus, OH cover band These Guys Live. 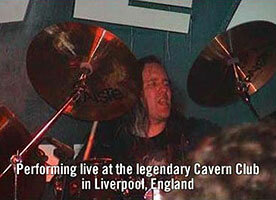 He has also played with many other local bands including Breaking Sane, Level 7, Jaded, Sonic Boom and the VV Smith band. Marty is a hands-on teacher who takes pride in developing customized lesson plans for every student based on their current skill level and goals. Primary areas of focus include: rudiments, stick control, music reading, coordination & independence, syncopation, double bass drumming, and general musicality. Marty's knowledge, experience and patient teaching style can help students of all ages and abilities develop the skills they need for a rewarding life in music. 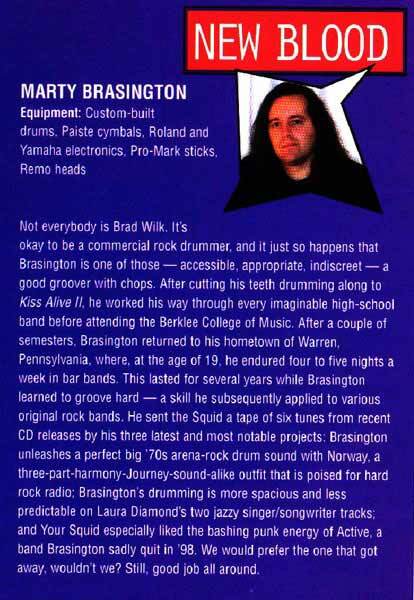 Marty in Modern Drummer magazine! Want to hear some of my recorded work? Below are a few streaming mp3 files from some of the recordings on which I have appeared. Click a song title to listen. Below are just a few videos of bands I've played with over the past few years. Most of the 'Drum Cam' videos are just short snippets as the raw stage sound isn't perfectly balanced. More to come as I dig through the archives. FYI: Clips with anything 'drumistically' interesting are a bit hard to come by when you've been stuck playing classic rock. Anyone want to put together a progressive fusion band?!!! Please view the most popular lesson package options below for special discount pricing. Contact me to inquire about currently available lesson times. Includes 6 half-hour standard private lessons. Includes 6 hour long standard private lessons. The Standard Private Lesson Package - 4 Pack is a block of 4 lessons. You will receive 4 half-hour or 4 hour long private lessons. Schedule lessons every week, every other week, or whatever best fits your schedule. Includes 4 half-hour long private lessons. Includes 4 hour long private lessons. The Standard Private Lesson Package - Big Block is a substantially discounted block of 13 lessons making it the most economical choice for long-term learning! You will receive 13 half-hour or 13 hour long private lessons. Lessons are scheduled every week over a 3 month (13 week) period. Includes 13 half-hour long private lessons. Includes 13 hour long private lessons. For those students looking for the occasional single lesson to work on something specific, you can schedule an Individual Private Lesson. Includes a single half-hour long private lesson. Includes a single hour long private lesson. If you'd like to submit another payment (i.e. to make a payment for a custom lesson plan previously discussed and agreed to) please click the 'Buy Now' button below and enter the amount you wish to pay in the 'Price per item' box on the following PayPal page and click the 'Continue' button. If you have any questions, please contact me. The PayPal page will show the full business name "Columbus Drum Lessons." Your credit card statement will show the charge as "PAYPAL * COL DRM LES." For new students, once your payment is confirmed I will contact you to gather some preliminary information and to schedule the exact dates and times of our lessons. Unless otherwise specified, all lesson packages expire 120 days after the date of purchase, so please plan to use all lessons within that time. To cancel any lesson package and receive a full refund of your payment, you must notify me at least 48 hours before our first scheduled lesson. If you wish to cancel your lesson plan anytime after your first lesson (including 'Free Introductory Lessons'), 50% of the unused balance will be refunded upon request. Any lesson that is missed without prior notification must be paid for in full, no exceptions. What sets you apart from other drum instructors? I have performed and recorded with many different artists and bands over the years, which has helped me build great diversity in my playing. Each artist I have worked with has helped me grow as a musician, and through those varied experiences I have been able to gradually develop and refine an outstanding curriculum to pass on to my students. I've also been a lifelong student of the instrument as well, starting from my early days in school band and orchestra and progressing through high school marching and stage bands, drum corps, studying at Berklee College of Music, and continuing to this day. While my exact teaching approach will vary from student to student, essentially it comes down to: a) determining the students goals; b) assessing their current skill level; and c) developing a curriculum to help them improve their proficiency in order to meet their goals. For example, for a high school age student looking to audition for marching band, we'll spend the majority of lesson time building hand technique through rudiments and stick control exercises, along with a good amount of music reading. For a drummer looking to sharpen their skills and better their performance with their band, we'll identify those areas needing work (i.e. basic timekeeping, coordination, double bass playing, etc.) and work on each area as needed. Do you accept students who have never played drums before? Absolutely! In fact, that's the best way to start. By seeking qualified instruction right away, students can avoid developing bad habits that could take significant time and effort to correct later on. The majority of my students have less than 6 months playing experience before starting lessons. I happily teach each both children and adults. However, I generally ask that students be at least 10 years old to start lessons with me. This is not to say that younger children are incapable of learning drums. It's just not an age group I am particularly comfortable teaching. However, if you have a young student interested in lessons please feel free to contact me to discuss. Am I too old to learn to play? Absolutely not! There is no such thing as too old to learn something new. I've been playing drums for over 35 years and I'm still learning! If you have the desire to study and practice, you can learn to play! I've been playing for a long time. Will you make me start over from scratch? Even if you wanted to, it would be impossible to completely "start over." Your past musical experience is part of you. For students who have extensive experience we will define your goals, identify your weaknesses and develop a curriculum to strengthen those areas. How long before I get really good? How good are you now? ;-) All kidding aside, everyone is different. If you're motivated and have an innate natural ability you could show significant improvement after just a few lessons. Others may take longer to make noticeable strides forward. I can help give you the tools, but what you build with them and how long it will take will be entirely up to you. Do you help students play actual songs? Yes! While many drum instructors work exclusively on technical exercises, only by learning how to utilize technical proficiency in a musical context will you be able to reach your goals. Do all your students need to learn to read music? I strongly encourage all students to learn to read music. Especially when delving into advanced rhythms and coordination/independence exercises, knowing how to read music will allow them to see exactly how each limb interacts with the others and at exactly which moment in time. This visual aid can help students learn much faster and help them understand concepts that might otherwise be difficult for them to grasp. What kind of music do you play and/or like? 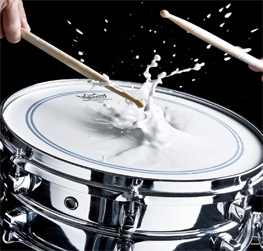 As a drummer, I'm naturally drawn to styles and artists that are "drumistically" interesting. My iPod is constantly filled with a diverse mixture of artists and styles. I can listen to big band music, followed by some avant-garde fusion to full-out, double bass blazing heavy metal. Professionally I have played everything from pop, rock, hard rock, heavy metal, jazz-fusion and country! Can you teach me to play rock? Or jazz? Or deathmetal? Or...? As a working drummer, I've played virtually all types of music at one time or another. For new students, all the various types of music tend to sound extremely different from one another. However, as you develop a strong knowledge of drumming, it becomes clear that almost all styles of music are based on the same fundamental elements of rhythm. Lessons are given at My Place Productions LLC, a rehearsal and recording studio located at 1000 Taylor Station Rd, Ste G, Gahanna, OH 43230. Click here to view lesson options and sign up! What do I need to have to start lessons? If you're just starting out, or just want to concentrate on the snare drum, you can get started with nothing more than a pair or sticks and a basic practice pad. (I can even supply these for the first few lessons.) Good quality sticks and a decent practice pad are both very inexpensive; you should be able to get both well under $50. (Ask me if you have questions.) As you progress I'll ask you to purchase the occasional book to allow you to practice between lessons. And, of course, when you're ready for full drum kit lessons, you'll need a set of decent acoustic or electronic drums. Again, I'm always happy to help you determine the right equipment for you if you have questions. I am currently teaching weekday late afternoons and early evenings Tuesday through Thursday. Contact me to inquire about currently available lesson times or if you have any special scheduling requests. What if I need to cancel or change the time of a scheduled lesson? To cancel or change a scheduled lesson, all you need to do is call or email me at least 24 hours prior to the time of our appointment. Any lesson that is missed or canceled after the cut-off time must be paid for in full. I want to learn to play drums! How do I get start lessons? Go to the Lesson Signup section to find out about my special options for new students. Then, simply register using the PayPal buttons. Or, send me an email through the contact form. I will promptly respond to answer any questions you might have and to schedule our first lesson together! I look forward to meeting you! This free PDF lesson is a great endurance and stick control exercise taken from George Lawrence Stone and popularized by Joe Morello in his "Master Studies" book. Please contact me if you have any questions about how to practice this exercise. Download a free, printable PDF of this lesson. In this free PDF lesson you'll get 6 new ideas for creating sextuplet fills and solo ideas utilizing note groupings of 2, 3 and 4 between the hands and feet. Feel free to contact me if you have any questions about any of the examples. Think of the drum rudiments as the "building blocks" of drumming. They are roughly equivalent to a pianist or a guitarist learning and practicing their scales. These rudiments are important to help a drummer develop technique, control, coordination and become technically competent. Download a free, printable PDF of all 40 P.A.S Rudiments. Drum tuning is an often overlooked and mystifying concept to a large percentage of drummers, even many who've been playing for years. Check out this video for a great overview of basic drum tuning by DW's John Good. Whenever possible, I do prefer email correspondence as email prevents me from being interrupted with non-urgent calls and text messages during lessons. If you're a prospective new student or have questions and would like to speak with me, be sure to include a valid email address. I will generally email you first to schedule a time to talk, as I am frequently busy until quite late in the evening. Copyright © 2019 Marty Brasington & Columbus Drum Lessons. All Rights Reserved. Site by CodeMonkey Design.